Sports Costs > How Much Do Rollerblades Cost? How Much Do Rollerblades Cost? Rollerblades, also called inline skates, are different from roller skates. While roller skates have four wheels, two in front and two in back, roller blades have four wheels in one line down the middle. Some roller blades are simply made for recreation while others are made for speed skating or doing tricks and jumps such as those done with skateboards. The cost of inline skates will depend on the type you’re looking to purchase and where you purchase them from. A recreational pair of roller blades made for boys or girls will cost $20-$70 depending on the brand and features. The Roller Derby Coyote adjustable girls roller blade, for example, retails for $50. A recreational pair of rollerblades for men or women can cost $50-$200. The Bladerunner Women’s Pro 78, for example, can be purchased for $60, while the Men’s Rollerblade Crossfire 90MX can retail for $170. A pair of street rollerblades used for doing tricks, such as the Rollerblade NewJack Street Skate, will cost $150-$300. A pair of inline speed skates, such as the Luigino Attitude 195, can cost $200-$1000. SkateFAQ.com notes $150 skates will be worth more than $30 skates, but $300 skates will sometimes be as good as $150 skates. The website mentions you should steer clear of rollerblades that retail for less than $120 since they usually aren’t worth the money. There are four common types of skates: multi-purpose, hockey or speed. Multi-purpose skates make up the majority of the market and are made of plastic with a foam liner on the inside. Some will have laces, while others will use a buckle system. Hockey skates will be made from a stitched leather and very few will used a foam liner on the inside. These skates tend to do well on a hockey rink, not outdoor, uneven terrains. Most will use laces, but you will find some that use a velcro strap around the ankle area. Speed skates will usually be made from leather and will have a longer wheelbase to accommodate all five wheels. Most of the time, these skates won’t be found in a local store and you will have to purchase from a specialty store. Recreational skates will have a rubber break pad, usually on the back of the right rollerblade to help with stopping. Many children’s skates will come with an adjustable boot to grow with the child’s foot. Street skates will have a space between the second and third wheel. This allows a street skater to drop-in ramps and jumps more easily. 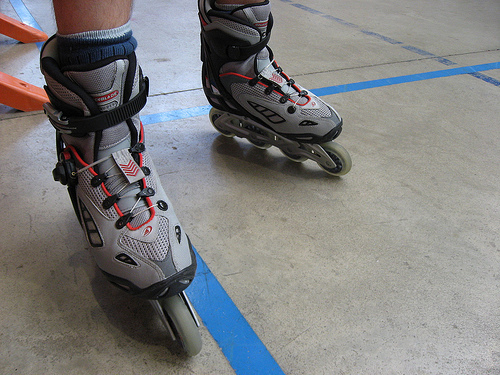 Speed skates will usually have smaller boots and larger wheels. They will not normally have a break. While the body and boot of the rollerblade will last a long time, the wheels and breaks will need to be replaced every so often. Rotating the wheels will help them last longer, but they will still need to be replaced about once a year with moderate use. Breaks will be about the same. Breaks will cost about $5, while the wheels can cost up to $8 per wheel. Don’t forget to include safety gear. This will include wrist guards ($10), knee pads ($15 to $40) and elbow pads ($15). If purchased in a combo pack, this can bring the costs down. While optional, a bike helmet is recommended while skating. A good helmet will cost about $40 to $65. Just because the rollerblade is cheap, it doesn’t mean it’s going to be a great deal. Be sure to research the reviews online as this will give away a good amount of information in terms of the rollerblade. Cheaper skates tend to have bad reviews due to the quality and durability. Highly consider trying the rollerblades on in person. This is going to give you a good idea on how they are going to fit. Purchasing them online can result in a bad fit, even though the size is the same. Always make sure that the skates have a tight fit. If the skates don’t have a tight fit, this can result in things such as blisters or even rashes alongside the foot. Make sure that your toes are close to the end, make sure the skates don’t pinch the heel and also ensure that your heel can’t move around freely. When trying the skates on in the store, make sure you’re wearing your socks as if you were using it. It’s a good idea to bring along athletic socks. If you’re new to rollerblading, try to skate in a place that’s clean and not filled with people. Ensure that there is no dirt laying around on the ground. Even the smallest stone can throw off a skater. Skates will usually be a half-size larger or a half-size smaller. Like sneakers, each brand will have its own size. If you are not going to rollerblade on a regular basis, it is better to buy a cheaper pair of rollerblades as they will do the job. Rollerblades can be purchased used using websites such as Amazon, eBay, and Craig’s List.